Large Herend Porcelain Figurine Hungarian Man 5440 Hussar, 13 Tall Hand Painted. You have found the missing pieces to your porcelain collection! 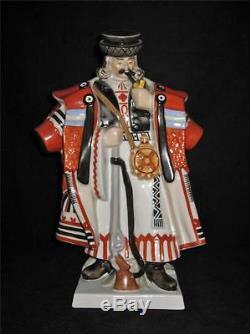 Here is a large hand painted figurine of a Hungarian man from Herend, Hungary. The numbers on the bottom look like 5440. 13" tall by 8" wide by 5 1/2 deep, it's in e.
Xcellent used condition, no chips or cracks. It weighs 5 1/2 pounds. Please see our other listings for more Herend porcelain. We will normally get back to you within 24 hours. Thanks for looking at our listing! We find them at Central Florida antique shows, auctions and estate sales. Antique or vintage items may, by nature have flaws and imperfections due to age. While we are not experts on this merchandise, we do our best to describe them as accurately as possible through pictures and descriptions. We do this as a hobby and strive to make our customers happy. Add a map to your own listings. The item "Large Herend Porcelain Figurine Hungarian Man 5440 Hussar, 13 Tall Hand Painted" is in sale since Wednesday, December 10, 2014. This item is in the category "Pottery & Glass\Pottery & China\China & Dinnerware\Herend". The seller is "claireted" and is located in Orlando, Florida. This item can be shipped to United States, Canada, United Kingdom, China, Mexico, Germany, Japan, Brazil, France, Australia, Denmark, Romania, Slovakia, Bulgaria, Czech republic, Finland, Hungary, Latvia, Lithuania, Malta, Estonia, Greece, Portugal, Cyprus, Slovenia, Sweden, South Korea, Indonesia, Taiwan, South africa, Thailand, Belgium, Hong Kong, Ireland, Netherlands, Poland, Spain, Italy, Austria, Israel, New Zealand, Singapore, Switzerland, Norway, Saudi arabia, Ukraine, United arab emirates, Qatar, Kuwait, Bahrain, Croatia, Malaysia, Chile, Colombia, Costa rica, Panama, Trinidad and tobago, Guatemala, Honduras, Jamaica, Barbados, Bangladesh, Bermuda, Brunei darussalam, Bolivia, Ecuador, Egypt, French guiana, Guernsey, Gibraltar, Guadeloupe, Iceland, Jersey, Jordan, Cambodia, Cayman islands, Liechtenstein, Sri lanka, Luxembourg, Monaco, Macao, Martinique, Maldives, Nicaragua, Oman, Peru, Pakistan, Paraguay, Reunion.